Serena Williams wins the Australia Open whilst 8 Week Pregnant! You are here: Home / Latest News / Tennis / Wimbledon Championships / Serena Williams wins the Australian Open… whilst pregnant! Serena Williams wins the Australian Open… whilst pregnant! Serena Williams wins the Australian Open while (accurately) eight weeks pregnant, without dropping a single set! She returned to the Women’s Number One world ranking spot just after winning the Australian Open. She is returning as a mother next year as her first unborn child is due in this autumn. Williams will not play again in 2017 which means she’s missing out on the French Open, Wimbledon and the US Open. 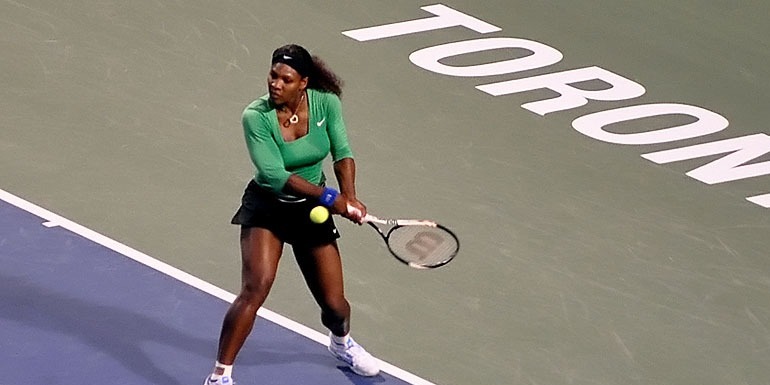 Earlier this week, Serena has faced some racism by Ilie Nastase about William’s unborn child. Nastase was escorted off the court with bad mouthing at officials. The Romanian has yet not apologised for the actions he has caused. 70 year old Nastase publicly made controversial racist remarks about Serena’s unborn child. Serena Williams isn’t the only athlete to complete a sport while pregnant. Thirty-one year old Alysia Montano ran the 800m at the US race while thirty-four weeks pregnant in the time of two minutes and thirty-one seconds. She has won 800 National titles in the past four years. Jessica Ennis Hill has backed Serena Williams’s case by saying it is possible to do sports while pregnant. Women’s Wimbledon title up for grabs? With Serena Williams out of this year’s Wimbledon Championships the title is wide open for anyone to win. The current favourite is World No 2 Angelique Kerber. Eventmasters still have Wimbledon Hospitality packages available for this year’s tournament. Call us on 0121 233 6500.
https://www.eventmasters.co.uk/wp-content/uploads/2017/04/Serena-Williams.jpg 385 770 admin https://www.eventmasters.co.uk/wp-content/uploads/2017/07/logo.jpg admin2017-04-25 12:48:542017-04-25 13:25:10Serena Williams wins the Australian Open... whilst pregnant!